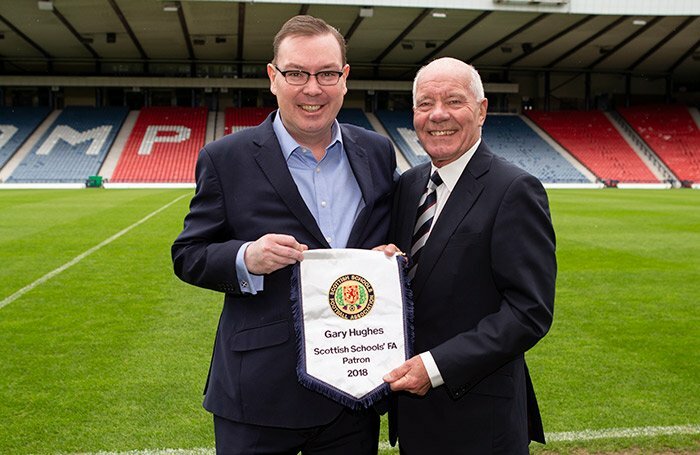 The Scottish Schools’ FA (SSFA) today announced Gary Hughes as their new Patron ahead of the Boys’ Senior Shield final which takes place at Hampden on Friday 4 May, 7pm kick off. Gary Hughes has made a significant financial contribution to the SSFA to help secure its future and ensure ongoing support for their programme of national competitions. The Scottish Secondary Shield is the oldest school football tournament in the world, first played for in 1904, with the winner being Paisley Grammar School. This year’s Boys’ Senior Shield finalists are St. Ninian’s High School, Giffnock and Cathkin High. Gary Hughes will be presented to the teams prior to the match and will present the trophy to the winning captain at the conclusion of the game. Below is a video with Hon. Treasurer Alex McMenemy, Gary Hughes and SFA Performance Director Malky Mackay talk about Schools’ football and its contribution to the life of youngsters.